Nicki Chapman is country property-shopping in Somerset with a couple who have already sold up and are desperate to invest £425,000 in their perfect rural retreat. Browse content similar to Somerset. Check below for episodes and series from the same categories and more! which poet to rest here? Find out where we are and who that was in just a moment. Hands up if we like this room? but are yet to find their perfect property. Have you had this reaction like this before? But, with our help, their luck might be about to change. for the celebrated 20th century poet TS Eliot. and spent his life teaching and writing in London. in the heart of England's West Country. which runs from Burnham-on-Sea to Brean Down. extends west into the neighbouring county of Devon. who used the landscape as the setting for his novel, Lorna Doone. has inspired its residents and visitors for generations. to balance a quiet yet well connected country life. Somerset is also good value. for the whole of the south-west region. as today's buyers have found out. 23 years ago through some mutual friends. They hit it off straightaway. Terry is unassuming but very loyal and loving. and invited me along, and I just took to it from then. Since then, we've been playing, we play regularly. in search of a countryside retreat. We wanted a more rural lifestyle. and see a better view than we had. and everything that the country has to offer. and football clubs in the south-west. So they've set their sights on the villages of south Somerset. we used to travel out to the various villages, look for country pubs. that have got their own shops. forcing them to vacate with nowhere to go. and storage unit in North Perrott, in the heart of their search area. Well, we have actually got our main furniture. We've got our sofas and our dining table and our clothing. to rescue something that we need. is the opportunity to be able to find things again. Things that we've put away that I'm not sure where they are. the space has been gazumped every time. and play my congas, then I will be absolutely fine. Annie's focused on starting afresh. but, even so, aren't willing to settle for less than perfection. and we haven't found the one that says, "Yes." -We've found a garden, but we haven't found a house. Or we've found a house and haven't found the garden. So we're looking for that complete package. stretching our search area from south Somerset to Dorset and Devon. the make-up of their elusive dream property. Well, Terry and Annie, I have to say a very warm welcome to Somerset. So you've pulled us in to help you with this search. Cos you've probably looked at quite at few properties, I'm guessing. Well, we must have seen about 20, would you say? If not more. Between 20 and 30, I would think. I think it would be about 20. Yeah. that we're not prepared to compromise on. Can you give me some details about your perfect home? and they've given the building a bit of character. How many bedrooms are we after? It would be nice to have two bathrooms. What about the outside space, the garden? It's important to us because we both like outdoors. and we'd just like to develop our own vegetables. -We'd like to do a lot more in the garden than we have done. Are we looking for an outbuilding for these congas and the drum kit? We're looking for an outbuilding for the congas, yes. Otherwise your neighbours aren't going to like you, are they? -OK. That's a passion, isn't it? Let's remind ourselves of how much we've got to spend. -What is our top budget? -Top budget, really, is 425.
you're homeless at the moment, do I? Shall we get started? and a study or separate space for Terry to play his drums. and they'd like to have a tennis club nearby. We've got some wonderful properties ready for them to view. and, as always, our final property will add a twist to our search. is in the small village of East Chinnock. The village was historically known for a nearby salt spring. produced and manufactured in the area until the mid 19th century. just over a mile away in West Coker. just a short stroll from house number one. So may I introduce you to our first property? -I like the thatch, yes. It looks wonderful from the outside, really pretty. which is absolutely key to a thatch. -That was just done a few years ago. you've got about 15 more years on the thatch itself. because it has only just come on the market. -Would I be right, Terry? -Absolutely, we've not seen it. We would have definitely come to look at this. Are you intrigued? Would you like to step inside? originally this property would have been two separate cottages. which I hope will impress as much as the exterior has. I love the fireplace. Isn't it amazing? It's not a bad sized room in actual fact, is it? which is of a good size. -when you're looking at properties of this age, is unusual. added around 100 years after the property was built. with another dining area and the utility behind us. -And a range as well. -Terry's a very good cook. Are you? How's this kitchen for you, Terry? Is this workable? which would be useful for guests or visiting grandchildren. Now, the staircase is just up here. and, although of typical cottage proportions, all doubles. conveniently just across the hall from the largest of the bedrooms. but there is a bathroom right next door. they use the downstairs bathroom and you keep that for yourselves. -It's lovely having the two aspects, actually. A lot of natural light coming into the room. For me, it's a little small. into a dressing room. I don't know. you only need two, that would be a fantastic idea. Your study has gone, sir. We have a walk-in wardrobe. -The story of my life. but also the outside space. a stone outhouse and a garage. I think it's a space that will really appeal. Now, I'm thinking this has to be one of the most idyllic gardens. I'm hoping you're going to agree with me. -It is really, really lovely. Just morning coffee, lunchtime beer, evening gin and tonic - I'm sold. You've got it all worked out. How wonderful! So, top budget of £425,000. -What are we thinking for this, our very first property? I would say around about £415,000. I'm going to say £410,000. The good news is, it's under that. -Who fancies having another look around, this time on your own? -I thought you might. Be my guests. just a 15-minute drive from their current tennis club. The size of the garden is terrific. you can see into the field next door, the pasture land. about five, ten minutes from here. We've got a bridle track just outside the door. So it is, for me, a good location. maybe, a step too far. Have you been won over by our thatch? Well, hold that thought, because we've still got more to show you. The West Country is renowned for being the home of British cider. bold, fruity flavours of the fermented apple drink. But one local baker has taken the leap into vegetable fermentation. Gordon, from their home near Wellington for nearly ten years. experiment with fermenting vegetables four years ago. we've sent them to find out more. Why do we ferment foods, then? vegetables that we have in the summer. the live bacteria that are on plants, are broken down. It enhances the B vitamins, it makes the vegetables more digestible. Great. So, OK, so I'm going to show you how to make a simple kraut. but the kind of krauts that I make are a hybrid. ..chop our cabbage up fine. multiply and do their work to make our delicious kraut. I'm going to give you a cabbage here, both of you. So we are using a hard cabbage as the base for our kraut. and we're going to do a kind of scrunching movement. Our scrunching is getting the juices running as well. squeeze it and we get the juices running. So that is just cabbage juice. so the bacteria can thrive. then it's over to Terry to sample. How does that taste to you? but it's not enough for a fermented kraut. So I'm going to add a little bit more salt. as airtight as possible, before she adds a layer of wild garlic flowers. I really like wild garlic flowers, I think they look really pretty. of the cabbage because that pokes up inside the concave of the jar top. -Then we're going to close it. -It will be ready to eat in three to five weeks. and rhubarb fermented with ginger and cardamom. So, Katie, what would you eat these with? chutney. You'd have them on the table. then I might add a little bit of this piccalilli to it. -get the full thwack of that sour flavour. -And the texture and the flavour. vegetables crunchy under the liquid, all that time. Katie believes the benefits of fermented vegetables are huge. but are far easier to digest. If it's OK with you, can we stay for lunch? -We can carry on eating. accommodation, are searching for a countryside retreat of their own. the pressure is on to find them their dream property. Still to come, our mystery house reveals a sight for sore eyes. -How's that for a surprise? region. This is quite something to be seen, it? and I don't think we've hit the mark quite yet. in this part of the county. So we decided to take Terry and Annie a little bit further afield. But will our mystery house be a step too far, I wonder? We're border-hopping into Dorset for our next property. after his defeat in the 1651 Battle of Worcester. the hills. Now for something completely different. -I like this a lot. -Yeah, and it has a rill. You're right. It's an unusual word as well, isn't it? You know your gardens. You know your streams. So, that's a very strong start. with some more modern additions and styling. house, which leads to the original entrance hall. So we have two sitting rooms off the front door. This is the smaller of the two. So you've got the original floor. -Look at those flags, fabulous. Do you like the idea of having two reception rooms? Yes, that makes life more adaptable. or change it, and maybe have it as a study or whatever. We'll have to see how big the other one is. Hm. It's always been taken away from me. -This would make a fabulous study. -OK, well, first room - so good, so far. Let's see how we get on next door. This is your second sitting room, leading on to a dining room. And I like the log burner. like the chimney breast here, and the exposed wall. -Which will take us to the kitchen. So it flows, the kitchen, into the dining room. Quite handy for when you are entertaining. Yes. I do like this. -There is a lot of storage here, by the look of things. when you packed everything up from the kitchen? Oh, the essentials. Knife, fork, corkscrew. -That's it. Knife, fork, corkscrew! one already in use as a study. with separate bath and shower. That looks like a king-sized bed. -and you've got the views again. now to find out if the garden gets the go-ahead. and plenty of space to build an outbuilding for Terry, if required. So here is your back garden. It isn't the biggest of gardens. but with these borrowed views, you might not mind too much. -Yes, well, I agree with you. -It's the best of both worlds. Now I'm going to have to focus your mind on the price. -I think I would go 390. -..a little bit above that. It's at the top of your budget. -It's worth it, isn't it? -See you later. I'm going to sit here in the sunshine. or in one of the downstairs reception rooms. It's in a picturesque rural spot, just a mile from the nearest pub. I love the facade initially, from the outside. "Gosh, we've got high ceilings." I must mention the flag floors as well. In the sitting room, I love that. Because then you really get a feeling for the age of the property. considered, but having said that, it's not isolated. As long as there's a pub that's not too far away, then it's all good! Are you happy, happy you've seen enough of the house? If we have to go, we must. -Yeah, it certainly ticks a lot of boxes for us. set in the heart of the Blackdown Hills. then later by the RAF. it was decommissioned and it became a popular civilian airfield. Somerset Microlights was set up here by Jim Greenshields in 1985. Today, he's invited me along to get a taste of the high life. I am very, very excited about today. So, tell me, how long have you been flying for? Cos I know I'm in good hands, but how good hands? I think it's just coming up to 40 years. And I thought, "Well, that's quite a big deal." "because everyone else has been doing it,"
and it kind of started from there. That was when my interest started. Very much so. I guess it's the old cliche about feeling freedom. one- or two-seater aircraft, which weigh around 265 kilos at most. for pilots to get airborne. First impressions, it's much smaller than I thought it was going to be. It's not a 747, is it? No, no. What's it made of? Mostly Duralumin, which is a very strong form of aluminium. The sail is Dacron, that's the ripstop Dacron, incredibly strong. And it's easy to handle when you're up in the air? -Very easy to fly, yeah. -So how does it actually work? which is exactly the same as a hang-glider. So you're actually holding this? with more than 2,500 registered pilots. -Put your left foot on the foot rest over there. And just lower yourself into the seat. Do you know what, I've got butterflies! Jim tells me it would take around 35 hours of training. And once you're qualified, the world is your oyster. This is it! Here we go! See what I mean? It goes up really quick. It goes up REALLY quick! we'll be turning right towards Taunton, roughly. and that's such an accurate description, isn't it? It is at this time of year. it all goes very patchwork-y as they cut the grass. That's good, just climb above the cloud. This is quite something to be seen, isn't it? ..Jim passes control over to me. -Put one hand on there. -Your mission now is to fly in a dead straight line. -I'll have a little snooze now, then. You're my ears and eyes! You're my safety blanket! that's the equivalent of going from here to the South of France. I don't know, I had my eyes shut. where they are currently renting. Our mystery house lies alongside the Grade I listed village church. property, and here she is. -You know it, do you? -I know it very well. -But we haven't seen this house. -No. Looks good from the outside. a good-sized window, really, for a cottage of this age. So, I'm hoping it's going to be light inside. Well, let's see if you are right, shall we? -For the final time, step inside. there's more to it than meets the eye, which I'll reveal in good time. a balance I think will suit our couple. every single one is very different. -Oh, what a great fireplace. -The flagged floor is fabulous. -This is a good choice. I love it. -It's a great size room. I love it. Right. OK, if you'd like to follow me. -More flags as you come through. -Yeah. It does get better. Great. -I think it probably is, yeah. Have you had this reaction before? -No, hand on heart, no. This is... Excited. It's fabulous. And it's right on our doorstep. I know! How has this happened?! -I don't have to sell you the area, do I? -You know it well, you're locals. Annie and Terry's faces have positively lit up. And to think, this property was right under their noses. So do you want to tell me about this room? the window. Stable door, fabulous. -Oh, that's a nice feature. And at the end, you've got a downstairs cloakroom. -The space works really well. -upstairs and show you the bedrooms. I'm thrilled our buyers already seem at home in our mystery cottage. Hopefully, they'll find the upstairs just as comfortable. -It's a big yes from me. Hands up if we like this room. -Without a doubt, look at the space. They've chosen not to put any wardrobes in here. they've made it into a cupboard. All along there is storage space. -I wonder whether I should. plus a patio area to soak up the morning sun. Yes. Not overlooked at all, actually. -No, you're not, are you? So maybe it's a compromise that maybe we are willing to reach. and if you'd like to follow me, I'll show you. Now, I think you should lead. This is... This is with the house? -Does this actually belong to the property? How's that for a surprise?! I would think about £435,000. So £10,000 above your top budget. Maybe it's because I love it so much that I think I can't have it. NICKI CHUCKLES I can hardly contain myself. -I am absolutely blown away. I know, I can see. Thank you. Thank you so... Oh, it's gorgeous. You're allowed. You haven't had a home for many, many months. -And hopefully we've just found you your new one. has blown Terry and Annie away. It's got two bedrooms as well as two separate gardens. just three miles from where they're currently renting. We know the village, but we didn't know this house existed. I immediately felt, "Oh, my word, I can picture myself here." "We've found it. I think we've found it." -This is the one for us. I'm going to have to drag you two away, I'm afraid. Well, I was just going to make some gin and tonics! do they still feel the same way? Well, this all looks very nice. doesn't it, for this next property of yours. but I wonder whether there's been a conclusion. we think that could be ours. So much so that we've actually made an arrangement for a second viewing. That is the best news. How quickly are you going to go and see it? We don't want to risk losing it. Yes. The garden has been the clincher, really, there, with that property. -..it was a done deal, really. -in your mystery house, how about that? So, what a conclusion and I am thrilled for Terry and Annie. especially with a garden like that. I'll see you again soon on Escape To The Country. 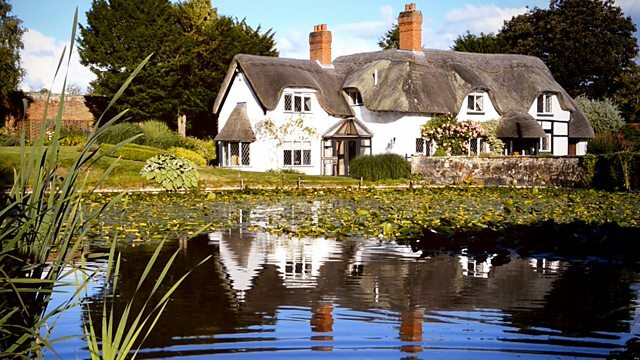 Nicki Chapman is country property-shopping in Somerset with a couple who have already sold up and are desperate to invest £425,000 in their perfect rural retreat after months of staying with friends. While in the south west, Nicki visits Dunkeswell Aerodrome, a former RAF airbase which is now a civilian airfield, where she takes to the skies in a microlight and sees the countryside from a completely different perspective.